With E3 2017 in full swing, we’ve already seen some amazing things coming down the pipeline. That being said, I’m here to talk about one game in particular, for which we’ve covered leaks & rumors since it was discovered…Assassins Creed: Origins. Can we just take a moment to talk about how good this looks? As is par for the course with the Assassins Creed franchise, we’re again being taken back in time to relive the memories & life of an ancestor to the Assassins Brotherhood, but this time with a bit more thrown into the story. In this chapter, we’re playing as Bayek; the last of the Medjay, and the man who will become the progenitor of the Brotherhood itself. The developers were gracious enough to not only give us a fantastic reveal trailer, but also take us through some gameplay (as played on the upcoming Xbox One X). 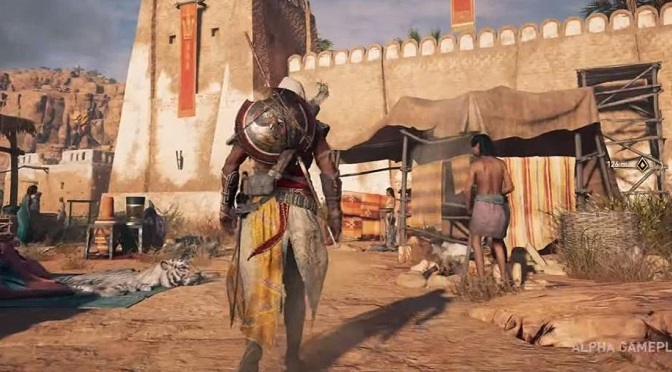 In the (Alpha) footage of the mission, we saw our protagonist Bayek entering the village of Siwa, in order to kill a corrupt priest who has taken refuge inside a (relatively heavily) fortified temple. Sneaking through areas, scaling walls, and everything else that has made Assassins Creed a phenomenon over the years was back, and seemingly bolder than ever. Graphically, this chapter of the Assassins Creed franchise looks highly impressive. Starting with the beautiful Egyptian landscapes and environments. These are a fairly big departure from the more recent cityscapes we explored in previous chapters like Unity and Syndicate (which, in all truth, got a bit drab & boring after a while). The colors in the game popped off-screen like never before, and gave us a real feast for the eyes – especially with the glare of the sun in the background when sliding down…the side of a FREAKING PYRAMID!!! The character outfits, the flora and fauna, even the sand in the trailer also seemed to have a level of detail in them that has been (in this writer’s opinion) a bit lacking in previous games. The metal looks like metal, and the cloth flows freely with character movement, giving a more kinetic feel to everything. Even when seeing the area through the eyes of Bayek’s eagle companion (named Senu), the Siwa Oasis still has a feel of the hustle and bustle of a thriving & populous area. Next, let’s talk combat. There did seem to be some minor issues with it here and there in the gameplay demo, but all in all it looked impressive. The devs showed off multiple tactics, use of the shield (a totally new addition to the Assassin arsenal), and what appeared to be a more responsive combat system, as well as a “less-scripted” form of encounter. The main fight that we saw in the gameplay demo was also almost reminiscent of the Dark Souls games, as Bayek went up against a guard who was quite a bit larger than the proto-Assassin himself, making it so our protagonist had to rely heavily on evasion and picking the right time to strike. In an interview with VentureBeat.com, Assassins Creed: Origins producer Julien Laferriere talked about the updates to the combat system, and the addition of more RPG elements, and how it has moved away from a more counter-oriented system into more brutal and realistic fights. With updated AI, enemies in a group will now attack all at once (making stealth even more important), and the player’s choice of weapon(s) will also affect how they interact with NPC AI characters. According to Laferriere, there are also over 150 different types of melee weapons, and the game will reward players with the learning curve. When speaking about the RPG elements, Laferriere stressed that the design of the skill tree and how players choose to upgrade their assassin was about player freedom. For stealthy gamers, upgrading the hidden blade for more silent and efficient kills is an option. For more warrior/tank types, there are weapons (two-handed axes and hammers) with varying rarity, which will appeal to that style as well. Last, but certainly not least, there’s the story itself. This is an Assassins Creed game, after all, and we know that story is important. The time setting for Origins is at around 46 B.C., during a time when Cleopatra was ascending to power, and Rome made many attempts to control Egypt. Bayek is the last of the Medjay, who functioned as police and pharoic guards, and were tasked with keeping Egypt safe. The fact that he is from Siwa Oasis seems to be no accident, either. This was actually the first place that Alexander the Great visited on his trek across that land, 300 years prior to the events of the game, and was home to the Oracle of Ammon. Bayek is not a member of the Assassin Order, but for good reason – he hasn’t founded it yet. Also significant to AC lore, is Bayek’s name. It’s actually a loose translation of the hieroglyphic “bik”, meaning “falcon” or “vulture”. While we don’t know much more about Bayek as a person, we do know that he has been tasked to hunt down a list of mysterious individuals – in the case of this gameplay footage, a man codenamed “The Crocodile”. How these individuals will feature into the millennia-long Assassin vs. Templar war is yet to be revealed, but it’s a good bet that one of them will become the creator of the Templar order; just like Bayek is to the Assassins. Overall, we here at PCU are excited and cautiously optimistic about this new iteration of the Assassins Creed franchise. The IP was once Ubisoft’s flagship property, and it looks like they’re trying to bring it back to its full glory by rethinking mechanics, using a brand new setting, and giving us a look at how things all began in the lore of the Assassin & Templar war. Assassins Creed: Origins arrives on PS4, Xbox One, and PC on October 27th, 2017.